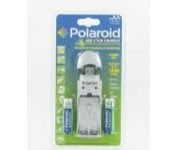 This is a review of the Polaroid USB battery charger.My Kodak Easyshare gets a lot of use. It's forever running low on batteries. I needed a small charger that would work on the go and could be powered easily. The Polaroid USB charger looked like it would fit the bill. In addition to to the charger itself the 3 other parts include a USB end cap and 2 batteries. It's about the size of my cell phone, lightweight and convenient to use. I just plug the Polaroid USB stick charger onto the side of my laptop and let it charge. The problem is that it takes forever for the batteries to charge. Plan on a good 24 hours. Laptops are designed to be used on the go. It's rare for a laptop to sit still for 2 hours much less 24! You can upgrade your batteries to a different type. These take 11-24 hours to charge. That's better but still impractical. Another problem is that as you move the laptop the battery charger becomes dislodged. It's fine if your computer is going to be still. Just don't bump it as you reach for that water bottle or textbook. The batteries become dislodged when jostled around in your bag. You'll want to wrap a rubber band around the charger to keep the batteries in place when they aren't being charged or used in your camera or electronic device. The Polaroid USB battery charger is a good idea. I just found it to be impractical for average use.